Bone ash is TriCalcium Phosphate in the form of Hydroxyapatite Ca5(OH)(PO4)3. This reacts when making bone china to give Anorthite (CaAl2Si2O8) and Ca3(PO4)2. 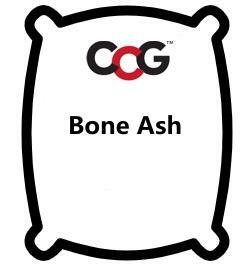 Real bone ash is obtained by calcining bone up to approximately 1100°C and then cooling and milling. This material is still manufactured today since some of its important properties are due to the unique cellular structure of bones that is preserved through calcination. Real bone ash has excellent non-wetting properties, it is chemically inert and free of organic matters and has very high heat transfer resistance. Bone ash has traditionally been added to porcelain to achieve a high degree of translucency (thus the name 'bone china'). The manufacture of bone china is difficult to master because the clays are non-plastic, ware is unstable in the kiln, and it is difficult to burn consistently to the body's narrow firing range. Today the availability of super-white kaolins, low iron feldspars and processed bentonites, smectites and hectorites makes it possible for almost anyone to make very white, translucent and strong porcelains even at cone 6. Bone ash is not common in glazes. When employed it can cause the slurry to flocculate and thicken (and produce a very thick layer on the ware surface which cracks during drying). People often react to this by adding more water, producing a glaze that shrinks even more on drying and eventually thickens again. A better way is to add a little deflocculant to the glaze slurry (like sodium silicate). Up to 1-2% bone ash can be used in enamels for opacification (more will usually cause pinholes). In glazes, as with enamels, too much or too high a temperature will cause blistering. In this use the phosphorus' influence toward a stiff melt generally checks the fluxing action of the calcia. Bone ash or calcium phosphate are used to opacify opal glass (1-3%) because the P2O5 content forms colourless compounds with iron impurities.